Season 5 brings another Kiss and Retelling as we take you back to the smoke filled rooms of film noir with our production of Shades of a Crime! 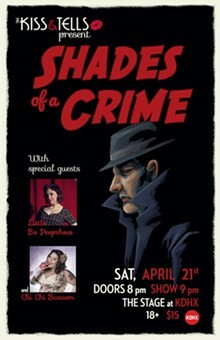 Shades of a Crime is a dark detective drama set against the backdrop of the 1940’s nightclub scene. Veteran P.I. Jack Thunderbird and his new right hand, Detective Bo, embark on a desperate search for truth in a city where leggy dames walk, money talks, and honesty seems hard to come by... But you don't hire a P.I. for the easy ones.